Temperature control trainer is designed for understanding the basic temperature control principles. 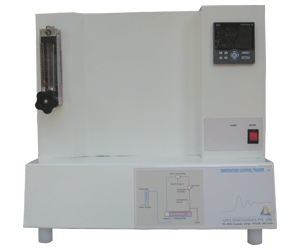 The process setup consists of heating tank fitted with SSR controlled heater for on-line heating of the water. The flow of water can be manipulated and measured by rotameter. Temperature sensor (RTD) is used for temperature sensing. The process parameter (Temperature) is controlled by microprocessor based digital indicating controller which manipulates heat input to the process. These units along with necessary piping and fitting are mounted on support frame designed for tabletop mounting. The controller can be connected to computer through ethernet port for monitoring the process in SCADA mode. Specially developed SCADA software is provided which helps in learning the principles of control.